Fig. 4-4. a. Vapor-liquid equilibria for CO2-SO2 at constant pressure. 6. Vapor-liquid equilibria for CO2-SO2 at constant temperature. same temperature, but at different total pressures. This is shown in Fig. 4-4 which gives the vapor-liquid equilibrium data for the system carbon dioxide-sulfur dioxide. Fig. 4-5. 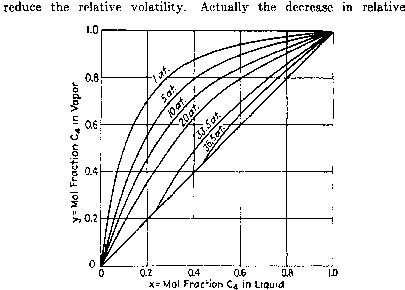 Effect of pressure on vapor-liquid equilibria. volatility is even larger than the result of these two factors. At the critical pressure of a binary mixture, the vapor and liquid phases become identical in all respects, and the relative volatility becomes unity. No separation is possible, not only because of the relative volatility effects but because differentiation between the vapor and liquid is no longer possible. This decrease in relative volatility to the value of 1 at the critical is a progressive effect, although a large part of it occurs close to the critical condition. The Lewis and Randall fugacity rule does not show the convergence of the relative volatility to unity at the critical. For example, in the case of a mixture like ethane and propane, the rule would show a finite relative volatility not only at the critical condition but at pressures much higher. This effect of total pressure on the vapor-liquid equilibria of the system n-butane-ri-hexane (Ref. 1) is shown in Fig. 4-5. The decrease in the relative volatility with increasing pressure is apparent, and the y,% curves become discontinuous at pressures above 30 atm. Thus, at 33.5 atm. the y,x curves exist only for liquids containing more than 24 mol per cent butane. Mixtures containing less than this amount of butane are at pressures above the envelope curve of Fig. 4-2, and only a single phase is present. At higher pressures the range of the discontinuity increases, and above 37.5 atm. the y,x curve becomes discontinuous at both ends because there are mixtures of butane and hexane which have higher critical pressures than either of the pure components. Above 38 atm. only one phase is present for all compositions. From the viewpoint of the ease of separation, it is almost always disadvantageous to operate at high pressure, but it is frequently necessary to accept this more difficult separation in order to obtain other desirable features of high pressure, such as higher condensation temperatures and lower volume of apparatus. The relative volatilities of all vapor-liquid systems do not decrease with increasing pressure in all regions. Thus, it is possible for abnormal mixtures to have an increase in relative volatility in some regions for an increase in pressure. It is in general true that they will not increase the relative volatility at all compositions. For example, in the case of ethyl alcohol and water at atmospheric pressure, the constant-boiling mixture is about 89 mol per cent alcohol. As the pressure is increased, the composition of the constant-boiling mixture becomes lower in alcohol, and the relative volatility of water to alcohol at a composition of 89 mol per cent becomes greater than 1 as the pressure is increased above 1 atm. and then decreases at still higher pressures. The approach of the relative volatility to unity at the critical means that the compositions of the vapor and liquid are identical. Thus the K values for all components equal 1. The temperature and pressure at which these values become unity are functions of the other components present. Thus, a mixture of butane and ethane would have a certain critical temperature and pressure, while a mixture of butane with hexane would have different critical temperature and pressure, but under both conditions the K value for butane would have to be equal to unity. Thus, the values given in Table 3-2, which were taken to be independent of the character of the other components and a function of the temperature and pressure only, cannot apply in the critical region. In most cases, these effects of the critical region are not serious at total pressures less than 0.5 to 0.7 of the critical pressure. Modifications of the method of utilizing the K values in the critical region have been suggested which allow for the effect of the other components present (Ref. 2). Immiscible Liquids. Immiscible liquids are not an important case encountered in fractional distillation. It is much simpler to separate two liquids which are insoluble in each other by simple decantation than it is by fractionation. However, the physical-chemical laws that apply to such cases are helpful in explaining certain of the phenomena involved in the intermediate case of partially miscible liquids. 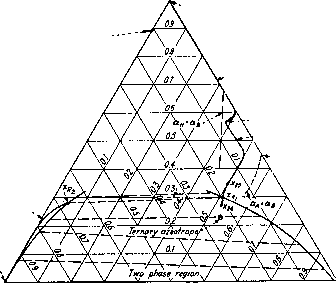 at high pressures, fx = Vifn = Ui&w**) U = ytf.2 = j where p = partial pressure P = vapor pressure 7r = total pressure y = mol fraction of vapor / = fugacity fir = fugacity of pure component at total pressure fp = fugacity of pure liquid under its own vapor pressure v = partial molal volume R = gas-law constant T = absolute temperature These equations are similar to those for miscible liquids except that the mol fraction in the liquid is omitted. It is to be expected that the fugacity relationship would give satisfactory results up to a pressure of approximately one-half of the critical pressure. 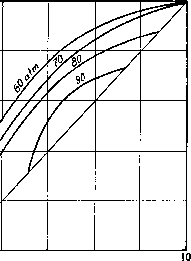 At higher pressures the Lewis and Randall fugacity rule for the vapor mixture would tend to be less satisfactory. Actually it is doubtful whether absolute immiscibility ever occurs. However, there are cases in which the miscibility is so limited that each phase would act as essentially a pure material, e.g., mercury and water. а. Mol per cent vaporized vs. temperature. 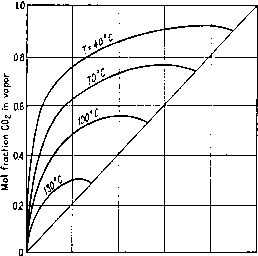 б. Mol fraction of toluene in vapor vs. temperature. What is the lewis randall rule?